There are many things the wonderful Josh Levi brings with him as soon as he gets up on the stage and performs – his microphone, his million dollar smile, his killer dance moves and his outstanding talent! The magnificent Josh Levi first stole the hearts of fans when he joined the hit, singing competition show, X Factor and ever since then, Josh Levi continues to amass more and more fans to his incredibly large fan-base. Each and every time I interview the terrific, Josh Levi he always has so many new projects to talk about and he continues to show how hard-working and truly stupendous he is! From performing on stages all around the world to performing at remarkable events like Vidcon and releasing new music – Josh Levi’s world is always a busy and extraordinary world! Both new and old fans enjoy going along with the fantastic Josh Levi as he continues to go on his marvelous, musical journey – which he continues to take the entertainment world by storm! Despite his massive success, Josh Levi is truly one of the most humble and down-to-earth people you could possibly meet and you could never see him without a smile on his face. This young man always radiates happiness to everyone around him! 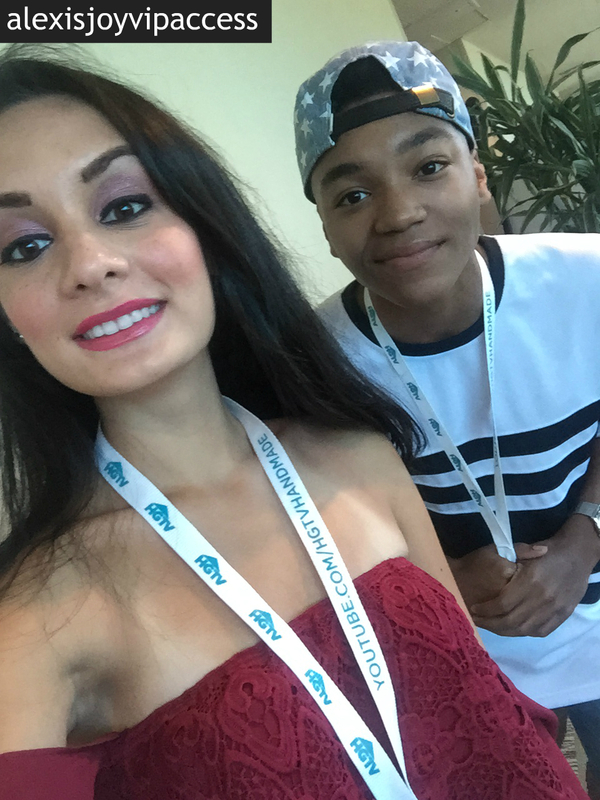 I, Alexisjoyvipaccess had an excellent time catching up with and interviewing the amazing Josh Levi again, this time as I covered the extraordinary Vidcon 2015 event again for my site! The exceptional Josh Levi dished exclusively to Alexisjoyvipaccess all about his upcoming projects, crazy fan encounters and so much more only in our VIPAccessEXCLUSIVE updated interview! The awesome Josh Levi even sends out some fashion advice to his fans and does a fun speed round – check it out in our updated VIPAccessEXCLUSIVE interview below! Thanks for another fun interview, Josh! Check out my VIPAccessEXCLUSIVE interview with the outstanding Josh Levi at Vidcon 2015 below! With its 6th year at the Anaheim Convention Center, the Vidcon 2015 event was another incredibly successful and legendary event. Bringing digital media pandemonium, Vidcon 2015 was another unforgettable three-day event for YouTube / Vine fans who had the opportunities to meet their favorite content creators as well as industry attendees. Vidcon 2015 manages to continue to get better and better each year with so many wonderful activities for attendees and Vidcon 2015 once again made digital media history! For more information on Vidcon, visit: http://www.Vidcon.com! Previous VIPAccessEXCLUSIVE: Nickelodeon’s “Game Shakers” Cast Interview With Alexisjoyvipaccess At Vidcon 2015! Next VIPAccessEXCLUSIVE: The Wonderful Jordan Doww Interview With Alexisjoyvipaccess At Vidcon 2015!